Nasi Lemak can be cooked in a variety of ways, ranging from the Malay, Chinese and Indian variation. It truly is a dish that symbolises the diversity of our country. This recipe was first published in Flavours.magazine. Place rice, salt and pandan in a rice cooker. Pour santan over until about 2cm above the level of the rice. Cook rice till done, then fluff with a wooden ladle. Sprinkle any remaining santan over and stir to mix. Allow to stand for 10 to 15 minutes, and keep warm. Place the chillies, shallots and candlenuts in a blender and process to a paste, adding a little water if necessary. Heat oil in a wok over medium heat, sauté the paste until fragrant, stirring continuously. Then add the rest of the ingredients and simmer for 1 minute. Set aside. 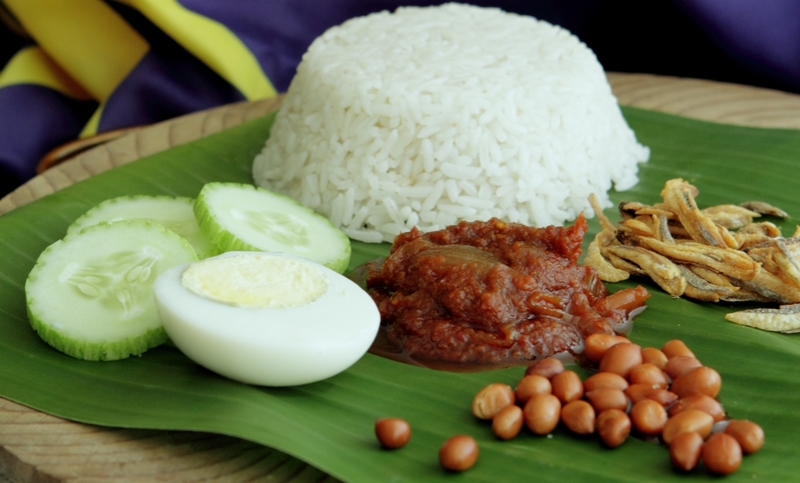 Spoon rice onto a cleaned banana leaf and arrange sambal, hard-boiled egg, cucumber, peanuts and ikan bilis around it.